A "storm of news" may be coming this week ahead of the start of summer vacation season, but the overnight session has been surprisingly quiet, with the BOJ's bond market intervention - the 3rd in the past week - the most notable event so far. "It’s been a somewhat slow start, but not surprising given the action-packed week that lies ahead which includes the BOJ, BOE, Fed, global PMI data, NFP,” said Oanda's head of APAC trading, Stephen Innes. "Indeed, central bank policy is back at the forefront of market discussions and particularly the BOJ rate decision and outlook report July 31." Among the most notable overnight moves, the JGB curve steepened again leading core rates markets, even as the BOJ's latest YCC operation saw heavy offers accepted as BOJ buys above market price. Sparked by fears the BOJ may tweak its QE program, large futures blocks in gilts, USTs and bunds through early trading accelerated the selloff. Meanwhile, the USD slowly weakened across G-10; SEK spiked higher on strong domestic GDP data while TRY tumbled as Erdogan showed little concern for potential U.S. sanctions; the Chinese yuan initially slumped but is now broadly unchanged. European equity markets hold small losses with Heineken (-5.0%) sliding and dragging the food and beverage sector lower after poor earnings guidance; U.S. equity futures bounced from overnight lows however still at bottom end of Friday’s range. World stocks fell modestly, US equity futures were flat, the dollar dropped on Monday, 10Y yield rose as high as 2.985%, JGBs sold off before possible BOJ monetary policy tweaks, and most metals fell on continued concern over global trade and China’s economy as a busy week of central bank meetings and company updates started. Disappointing updates from U.S. tech heavyweights soured the mood across stock markets, knocking European shares off their six-week highs at the open and dragging down by 0.11% the MSCI world index. As we discussed in "A Record Number Of Companies Are Beating Estimates... And It's Not Enough", JCI Capital's strategist Alessandro Balsotti said that "quarterly results continue to be more than good overall, but markets appear to be particularly sensitive to the sporadic negative updates, especially from tech stocks." JPMorgan reported relatively aggressive moves into “value” stocks - in particular banks - and away from shares leveraged to economic growth: "Tech really began cracking on Tuesday before the floodgates opened on Friday," JPM analysts wrote. "The rotation will likely continue, benefiting value categories at the expense of momentum/tech as rates are biased higher. 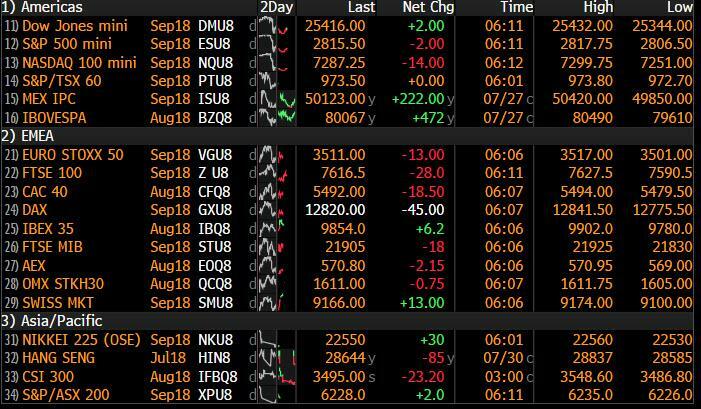 Europe’s higher weighting to banks/resource will help it vs the U.S."
Miners and food and beverage makers were among the top losers in the Stoxx Europe 600 Index. Equity specific news is supporting the FTSE MIB and IBEX with Mediaset (+3.0%) reporting positive earnings. The AEX (-0.4%) is currently the underperforming bourse as index heavy-weights Heineken (-4.1%) and Altice (-2.4%) are both in the red on the back of negatively revised guidance and a branch sale. Earlier, Asian stock markets similarly began the week on the back foot after the tech-led declines last Friday on Wall Street and amid cautiousness ahead of this week's slew of risk events, while further CNH weakness also dampened sentiment. ASX 200 (-0.4%) and Nikkei 225 (-0.7%) were in the red with the worst performing stocks pressured by corporate updates including Syrah Resources and Dainippon Sumitomo Pharma. Elsewhere, Hang Seng (-0.6%) and Shanghai Comp. (-0.2%) were initially choppy after the PBoC refrained from reverse repo operations for a 7th consecutive occasion but noted that month-end fiscal spending will increase bank liquidity, while further CNH weakness eventually weighed on sentiment and proved to be the deciding factor. Futures on the S&P 500, Dow and Nasdaq all pointed to a softer open following declines across most Asian markets. In FX, after starting off strong, the dollar slipped against most G-10 peers at the start of a busy week which sees decisions from the Fed, BOJ and BOE. The Bloomberg Dollar Spot index edges lower by 0.1% with the greenback down against seven of G-10 peers. The Japanese yen erased initial gains and Japanese 10-year yields retreated from an almost 18-month high after the the BOJ offered to buy an unlimited amount of bonds to stem fears the bank will tweak their ultra-loose policy this week and unleash a rout. The euro rose after German regional inflation data. Sweden’s krona strengthened the most in four weeks against the euro after data showed the nation’s economic growth accelerated more than forecast in the second quarter. Helped by the weaker dollar, emerging-market shares slipped while their currencies were stable, with a few notable exceptions: the Yuan and Lira have picked up where they left off last week, on the back foot, with USDCNY, USDCNH and USDTRY all higher. The PBOC yuan fixing dropped by 0.28% to 6.8131 per USD, the weakest level since June 2017 while the Turkish Lira continues to suffer after last week’s shock CBRT decision to leave key rates unchanged, with the focus now switching to the latest Inflation Report on Tuesday. The offshore yuan declined as much as 0.5% to 6.8497 per dollar, as China’s central bank weakened its daily reference rate and the dollar advanced. "The EM FX will remain under weakening pressure in the days and months ahead,” says Prakash Sakpal, a Singapore-based economist at ING Groep NV. 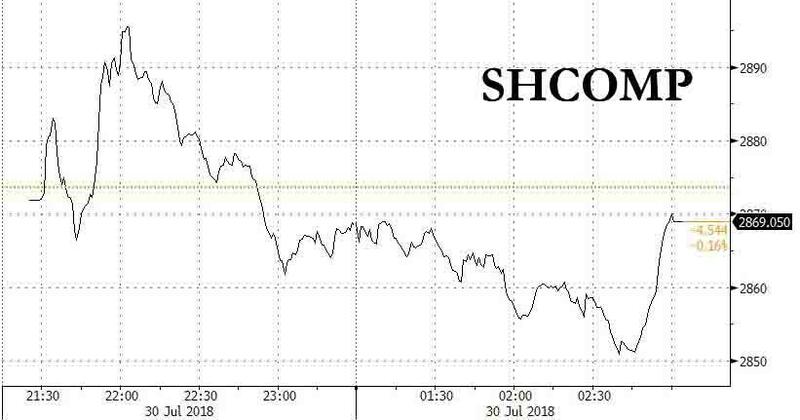 Overnight Bloomberg reported that analysts say China may cut RRR in 3Q, according to a China Securities Journal commentary. In separate comments, China’s Foreign Minister Wang Yi said at a press conference in Beijing that Chinese self-defense is justifiable in the face of an aggressive U.S.
Treasuries fell with euro-area debt, with the curve bear- steepening, matching moves across most of Europe. In commodities, oil prices rose but gains were limited as the fallout from trade tensions weighed on markets: WTI (+0.9%) and Brent Crude (+0.2%) recovered losses seen at the back end of last week following an uptick in the Baker Hughes rig count while Mexican President Obrador stated his administration will hike crude production by 600K BPD. Looking at the week ahead (read our full preview here), core central-bank policy decisions and 145 S&P company earnings reports, including from Apple and Tesla, are set to dominate news. Tonight, traders will focus whether the BOJ will fine tune its policy and later in the week will look for any indications the Federal Reserve is shying away from two more interest-rate hikes before the end of this year. Major European equity bourses are largely lower, with the FTSE MIB (+0.1%) the only bourse in the green, breaking though its 50 DMA of 21,913. Equity specific news is supporting the FTSE MIB and IBEX with Mediaset (+2.0%) reporting positive earnings and Sabadell (+2.7%) upgraded at KBW to outperform from underperform. The AEX (-0.3%) is currently the underperforming bourse as index heavy-weights Heineken (-5.0%) and Altice are both in the red on the back of negatively revised guidance and a branch sale. Taking a look at sectors, broad based losses are being seen with slight underperformance noted in the IT sector, following on from uninspiring performance in US counterparts on Friday. GVC Holdings (+5.0%) has assured a USD 200mln tie-up with the MGM group. Both the GEA Group (+6.0%) and Air Liquide (-2.6%) reported earnings, with GEA beating expectations and Air Liquide operating income falling short of expectations. In currency markets, the chance of a BoJ shift has sent the yen higher in the last week or so, leaving the dollar around 111.05 yen from a peak of 113.18 earlier in the month. Against a basket of currencies the dollar was hovering at 94.606 having repeatedly failed to clear resistance around 95.652 this month. The euro edged up to $1.1664 against the dollar in early European trading, after the European Central Bank reaffirmed last week that rates would remain low through the summer. In Asia, eyes were on China's yuan after it suffered the longest weekly losing streak since November 2015. It duly weakened further, slipping past 6.8400 per dollar for the first time since June last year. In commodities, WTI (+0.9%) and Brent Crude (+0.2%) recuperate losses (with the latter breaching USD 74.50/bbl to the upside) seen at the back end of last week following an uptick in the Baker Hughes rig count while Mexican President Obrador stated his administration will hike crude production by 600K BPD. Though news flow remains relatively light, a 12-hour strike is to start at Total’s UK offshore platforms at 12:00BST. Metals trade mostly lower with spot gold marginally easing, yet still rangebound, moving with an uneventful greenback ahead of key risk events this week (FOMC interest rate decision on Wednesday, US jobs data on Friday). Copper continues to trade lower while reports stated that workers at the world’s largest copper mine, Escondida mine in Chile, have rejected the final contract offer over wages and are voting whether to go on strike. A quick glance at our screens this morning shows that markets in Asia have started the week fairly sluggish. The Nikkei (-0.68%), Hang Seng (-0.69%), Shanghai Comp (-0.16%) and Kospi (-0.12%) are all in the red, seemingly playing catch up to Friday’s weaker session on Wall Street. Futures on the S&P are also weaker (-0.27%) while the focus in bonds is on JGBs once more where 10y yields are testing that upper limit again, having broken through 0.10%. In fairness there was very little in the way of new news for markets over the weekend to change the narrative. US Treasury Secretary Steven Mnuchin said on Fox News yesterday that the US is “well on the path” for sustained growth of 3% a year for “several years”, while White House Economic Director Larry Kudlow said that President Trump “deserves the victory lap” following Friday’s solid Q2 GDP print. Back to those central bank meetings this week, which of the three, the BoJ on Tuesday might be the most hotly anticipated given the various stories related to a possible yield curve tweaking over the last week. That said our Japan economists do expect the BoJ to maintain its current policy stance. In consideration of the side effects of its policy, the team believe that the BoJ will declare at the end of its statement that, based on its analysis in its quarterly Outlook Report, that it will maintain its easing policy for an extended period but will conduct financial market operations and asset purchasing operations to address the mounting cumulative side effects. Our colleagues believe one measure to deal with such side effects will include an overhaul of its ETF purchasing operations (a shift from Nikkei 225-linked ETF to Topix-linked ETF). An increase in the JGB yield target appears unlikely at a time when it is expected to revise downward its inflation forecast. For the Fed on Wednesday, no change in policy is expected and given that this is not a meeting that includes a post-meeting conference or a fresh summary of economic projections, it's likely that this will be less of a market mover. Our economists expect any changes to be perfunctory and cosmetic, though they note that the Fed could acknowledge some recent softness in the housing data. As a complement to June’s removal of forward guidance language, the statement could also include some language, such as the phrase “for now” featured in Powell’s recent monetary policy testimony. In the view of our economists, such verbiage would have the effect of including uncertainty into their gradual rate hike mantra. In our colleagues view this would de-emphasise forward guidance and reiterate that their actions are data dependent. More from our economists preview on the Fed here. As for the third central bank this week, the consensus expectation is that the BoE will deliver a 25bp hike on Thursday, something that the market is currently assigning a 85% chance of happening. Should they hike, which our economists expect the BoE to do albeit dovishly, then this would mark the first time since 2009 that the bank rate would be above 0.5%. It's worth noting that the latest BoE economic projections will also be released alongside the policy decision, including new forecasts for growth and inflation. It's also expected that BoE Governor Carney will offer an updated view on the neutral rate. On that our UK economists published a preview note (link) where they argue that the UK’s current neutral rate is between 0.25% to 0.50% with the risk being that the BoE’s estimate is at the higher end of this range. This would translate into a nominal rate of between 1.75% to 2.50%. If that wasn’t enough, as noted at the top there’s also another employment report to get through in the US on Friday – the highlight of this week’s data. Expectations are for a 193k July payrolls reading, an unemployment rate of 3.9% (down one-tenth from June) and an average weekly earnings reading of +0.3% mom. Our US economists also expect a +0.3% earnings print while their forecast for payrolls is 180k. Other than that, we’ve also got the June PCE and Q2 ECI data out in the US on Tuesday. Our economists are forecasting +0.7% qoq for ECI and a core PCE reading of +0.1% mom reflecting the weakness in the core CPI print in June. If the latter comes in as our economists expect then the annual reading will round down one-tenth to +1.9%, however this should be taken with a grain of salt given the BEA benchmark revisions with recent quarters’ inflation data revised upwards. In actual fact we’ll get a decent opportunity to test the global inflation pulse this the Eurozone, France and Italy on Tuesday. The Eurozone core reading is expected to come in at +1.0% yoy and up one-tenth from June. Last but by no means least, it’s another big week for earnings with 145 S&P 500 companies due to report. The big highlights are Caterpillar on Monday – which is always a good barometer for global growth – Apple, Procter & Gamble and Pfizer on Tuesday, Metlife on Wednesday, Dupont on Thursday, and Berkshire Hathaway on Friday. In Europe we’ll also get releases from the likes of Volkswagen, Siemens, BP, Barclays and Credit Suisse. Earnings certainly dictated much of how equity markets performed last week and it was no different on Friday with disappointing Twitter (-20.54%) and Intel results (-8.59%) contributing to the Nasdaq’s decline (-1.46%), while the S&P 500 (-0.66%) also finished lower. The Nasdaq was actually the only US equity markets that fell last week (-1.06%), while the S&P (+0.61%) and Dow (+1.57%) both advanced. In Europe, equities were all higher on Friday, with the focus also on earnings. The Stoxx 600 closed up +0.40% on Friday and posted its highest weekly gain since early March (+1.68%). Meanwhile core European government bonds were little changed on Friday while 10y Treasury yields dipped -2.2bp following the Q2 GDP data. Just on that, while Q2 GDP was slightly below consensus at 4.1% saar (vs. 4.2% expected) it still represented a jump of 1.9ppt from Q1. In the details, private consumer spending rose a firmer-than-expected 4.0% saar while a 9.3% saar jump in exports drove a 1.1ppt positive contribution to growth from net exports. The Q2 core PCE print was also slightly below market at 2.0% qoq (vs. 2.2% expected). Over in France, Q2 GDP was below expectations at 1.7% yoy (vs. 1.9%), in part as household consumption posted its first decline since the first quarter of 2014 (-0.1% qoq) while net exports also contributed negatively to growth. Looking at today's events, in Europe, we'll get the preliminary July CPI print for Spain followed by June money and credit aggregates data in the UK and July confidence indicators for the Euro area. In the afternoon we'll then get the July preliminary CPI report for Germany, while in the US the data includes June pending home sales data and the July Dallas Fed manufacturing activity print. Away from that, President Donald Trump will host Italian Prime Minister Giuseppe Conte at the White House, while earnings highlights include Caterpillar.